Myanmar is the second largest country in Southeast Asia. The nation’s economy is one of the least developed in the world and is suffering the effects of extended isolation and stagnation. More than 13 million people—26 percent of Myanmar’s population—live below the poverty line and 3 million people are spending a high percentage of their limited income on food with a restricted diet that does not meet all their consumption needs. Approximately 298,700 people are in need of food assistance. Development in Myanmar is being compromised by prolonged ethnic conflicts and intercommunal violence since its independence in 1948, resulting in massive displacement of people. In education, the net enrollment rate in primary schools is close to 88 percent, and 75 percent of children starting grade one reach grade five. However, the net completion rate is only 54 percent. The country’s vulnerability to natural disaster and the Government’s poor emergency response capacity has affected its socio-economic progress. Aung San Suu Kyi’s National League for Democracy party won a landslide victory in the general election in November 2015. A new cabinet led by the first civilian president since five decades ago took power in April 2016. 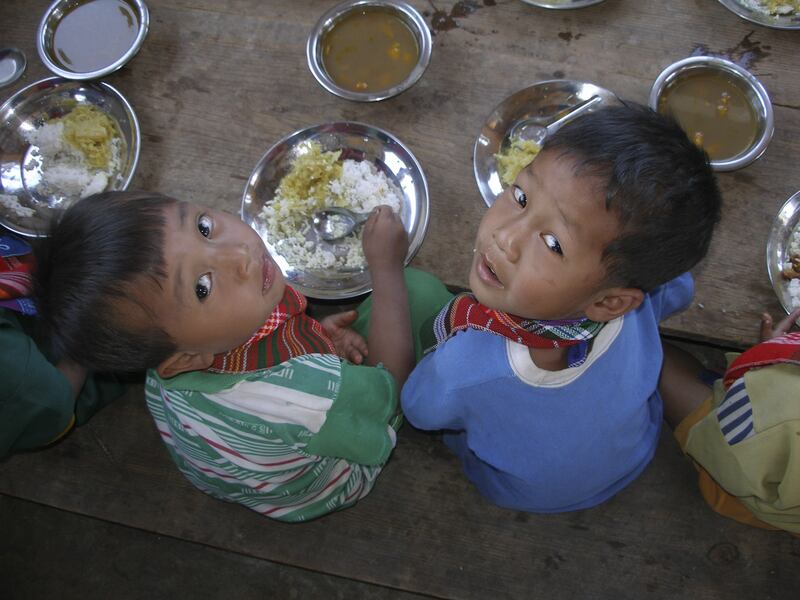 WFP implemented its first operation in Myanmar in 1978 in the northern Rakhine State and established its office in 1994. WFP is working to reduce poverty, food insecurity and undernutrition, responding to disasters and increasing resilience among the most vulnerable. WFP has been providing regular life-saving food assistance to more than 280,000 people displaced and impacted by conflict, violence and natural disaster. Nutrition – Linking with the national health system and in line with a national protection scheme, WFP provides nutrition-specific and nutrition-sensitive support for more than 145,000 pregnant and nursing mothers and malnourished children. HIV and tuberculosis program – As balanced nutrition is pivotal for both HIV and tuberculosis patients to keep the immune system strong, WFP provides food- by-prescription to 17,000 patients, aiming to enhance adherence and treatment success. Community asset creation – WFP strengthens community resilience by creating community infrastructures and providing cash or food for more than 200,000 people in exchange for participation in asset creation activities. School meals – WFP and the Ministry of Education have started working toward nationalization of the school meals program from the 2015-2016 academic year onward. More than 190,000 students participated in the program last year.